There seems to be a sudden surge of quaint cafes on this already congested island – is it just me? Or is that a fact? Normally I have very few options to consider when I want to go to some place simple for a sandwich or a pasta at reasonable prices. Nowadays, cafes like Food for Thought, well they just surprise me. If I’m not wrong, the place has been opened for more than 2 months now. 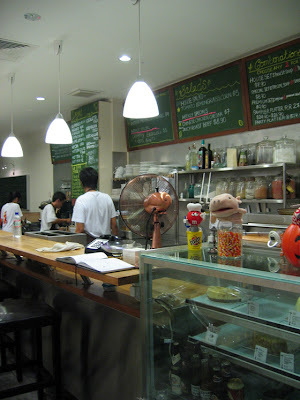 It’s situated quite prominently opposite the National Library at Bras Basah. Funny how I’ve walked past that area! I must have been blind. But it doesn’t matter now does it? Because I’m really glad to have visited it a few weeks ago because of the Amplify Oct/Nov birthday babies celebration. Passion, passion can be an acquired taste. sometimes. What in the world am I getting at? Hmmm maybe you’ll have to visit the cafe yourself to find out. I’m more intrigued by their passion for serving. By serving, I don’t mean waitressing etc. I mean giving back to the society. This cafe started not with the intention of making great profits that goes into their back pockets. No, this cafe was a humble idea mooted by the same people behind School of Thought, a “social enterprise that supports the educational needs of students from poor families”. How cool is that? Finally a group of selfless individuals who actually do give a damn. The sceptics might question their intentions but I, I’d rather give them the benefit of the doubt and pat them on the back. It takes a big heart to put others before yourself and an even bigger heart to go out of your way to make sure others feel loved. And I guess that’s where their Food for Thought cafe comes in. On their website, it is declared that “We believe in serving the community. Part of Food for Thought’s profits go into social causes that we support – including School of Thought’s Financial Aid Scheme for underprivileged students”. Now do you get my drift? I can go on and on and try to dissect their food offerings, or find fault with the salad dressing but at the end of the day, I do give it to them, the people behind this cafe, for sticking to their guns, for humbly trying their darnest to make a difference. So what did I actually eat? I shared the sandwich platter with Evan and Alvin, after spending a looooong time trying to decide what to get. Seriously, when it’s 8:30pm and you’re so hungry, you usually pick anything yes? But nooo I had to be fickle as usual and try to figure out which one to eat. Okay, their sandwich platters go this way: you pick which 3 fillings you want, and they serve it in small porcelain dishes together with freeflow foccacia bread. There’s also a salad and 2 soups thrown into the set. Cool eh? 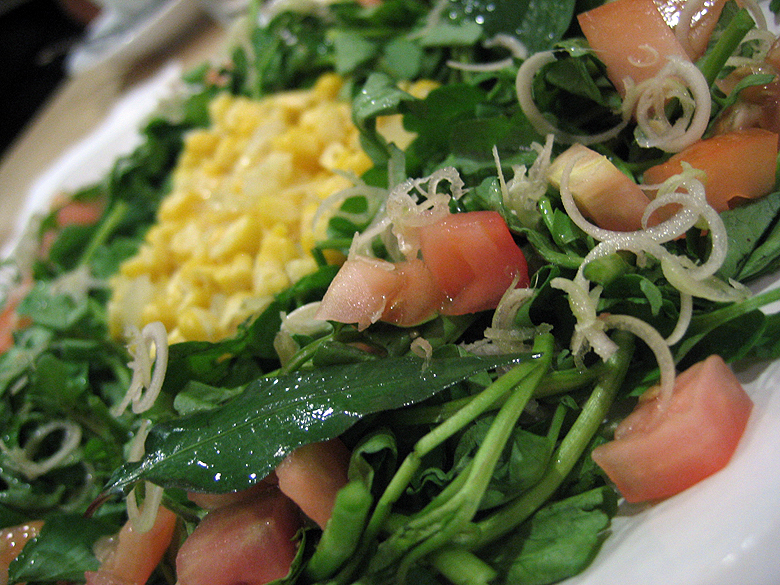 Our salad was some farmer’s corn garden I think? It was an okay salad but the watercress gave it a very raw bitter aftertaste. I was quite fine with it because I’m used to that typical watercress taste. Besides, I do know that it’s really healthy! But I wish they had used a balsamic vinegar (or some vinegar based dressing) dressing instead of just butter. 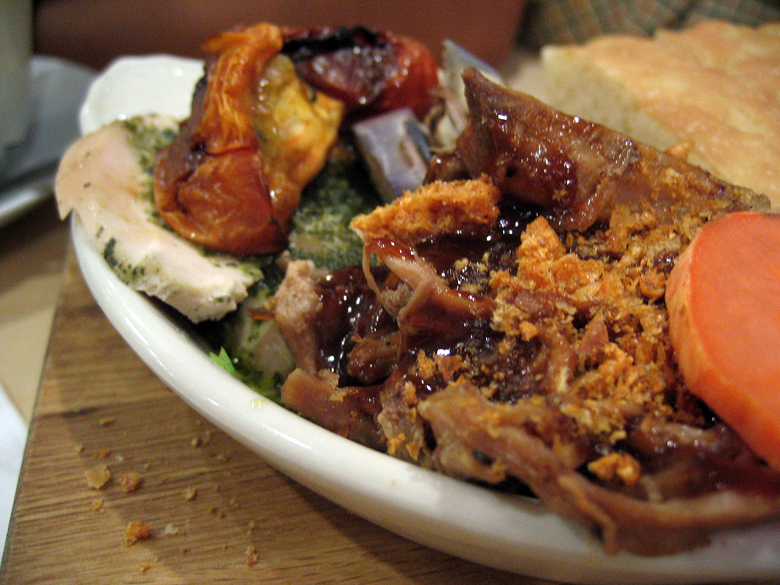 So the three sandwich fillings we chose were: roasted pulled pork, basil pesto chicken & some braised pork in soy sauce. 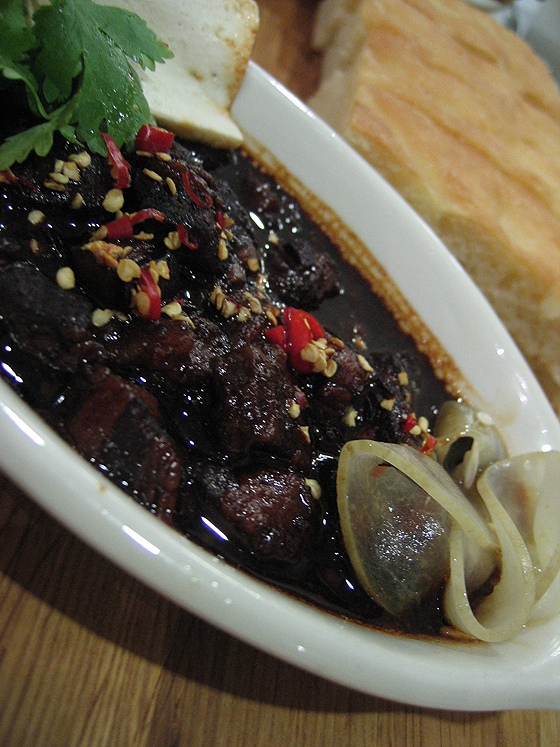 That’s the braised pork. It’s very asian. It didn’t taste too bad. I like the sauce; kept using the bread to mop it up. 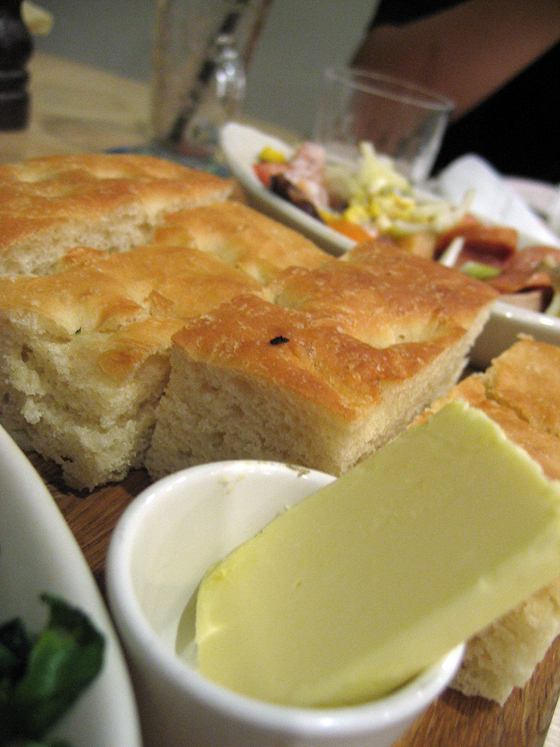 This is how the bread is served – on a wooden block. Love the presentation. You can ask for butter if you like as well. That dinner was pretty cool I think. I appreciated the fact that the owners didn’t mind our loud volume. Hmmm or maybe they just kept quiet about it! Whatever it is, I know it won’t be my last time there. I still have to try their red velvet cake! Was too full to try it that night. 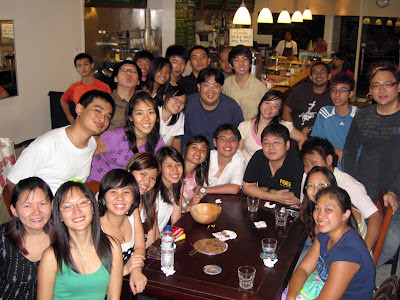 okay in case you’re wondering where the heck i am – i’m like the one in purple towards the left. I love all my dearest buds from Amplify. Food for Thought – good food for a good cause indeed. 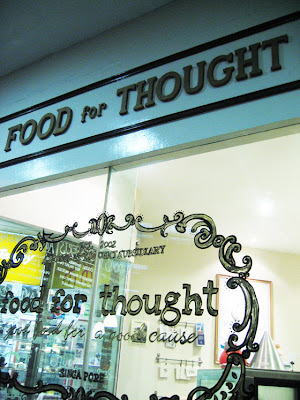 i thought the service at food for thought was rather commendable. just that at times some service staff do seem a bit inexperienced. 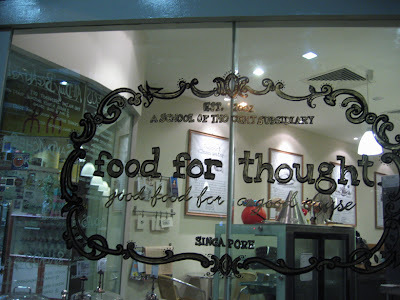 hi, i visited Food for Thought a few months ago too. Love their desserts.